The International Journal of Mathematics and Soft Computing (IJMSC) is published twice a year (both printed and online version). The journal is devoted to publish research articles in the field of Mathematics and Soft Computing. 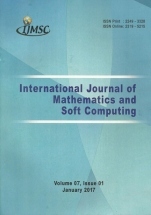 This is a broad-based journal covering wide spectrum of topics in all branches of Pure Mathematics ( Topology, Algebra, Real and Complex analysis, Functional analysis, differential equations, difference equations, …) and Applied Mathematics (graph theory, graph algorithms, combinatorics, discrete mathematics, discrete optimization, …), Computational mathematics and Soft Computing(Fuzzy systems, Neural network. Cryptology, Chaos theory, Genetic algorithm, …).